Surrounded by important buildings such as Ministry of Justice, the Parliament, and the Ministry of Education is a building more important still. It is the country's foremost mosque, a grand and opulent building with a beautiful blue dome inscribed with verses from the Quran, beneath which 7000 people may pray at a time. It was completed in 1989. There are two other sections, one for 500 women worshippers and another far smaller and closure resume for Royal patronage. Apparently this is the only mosque in the country which openly welcomes non-muslim visitors. 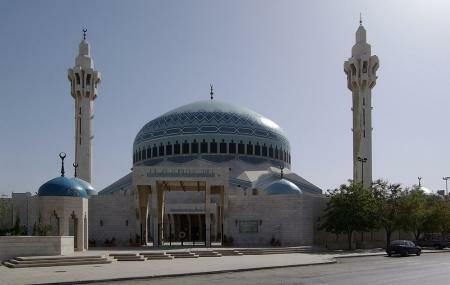 You will find an Islamic Museum inside with artifacts related to the late King Abdullah I. There may also be some archaeological artifacts. Women must wear headscarves before entering. Arms and legs must be fully covered. Shoes have to be removed before entrance. How popular is King Abdullah Mosque? People normally club together Al Balad - Downtown Amman and The Royal Automobile Museum while planning their visit to King Abdullah Mosque. It's always nice to see churches and mosques standing side by side. Be aware that you need to dress properly at the mosque. Long dresses to cover up legs and jeans can be found at the visitor entrance. The mosque is beautiful, open for all visitors. The entrance is 2 JD. Foreign women are required to wear black dresses that you get at the entrance and it's free. The mosque looks great both from the inside and outside. One of the nice mosques that ever visited and prayed inside. In King Abdullah mosque I prayed Jum’at at that time. An interesting view there a prompter for deaf people inside mosque.